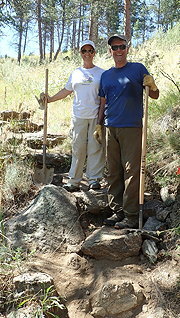 New members Mary and Steve Thompson On July 14, Rocky Mountain Flycasters members went up the Poudre Canyon to the Gateway Natural Area to work with the City of Fort Collins. RMF has partnered with the city in maintaining two overlook trails. Trail work is done in the morning followed by a provided lunch and in the afternoon volunteers have access to the main stem of the Poudre and the North Fork. It makes for a great day. This year, eleven people volunteered their time grading the trail, pruning bushes and building stepping stones. Carter Emsing, Marc Brown, Todd Juhasz, and Cullen Emsing Reports of fishing on the North Fork below Seaman Reservoir were—for some reason—sketchy and incomplete. Reader will infer from that what they will. Either the activity was spectacular or fish were scarce. If you would like to assist with future events, contact Dave Morse. Our TU chapter supports the Adopt-a-Trail program of the Fort Collins Natural Areas Department. Our trails are at Gateway Natural area on the Poudre River. In 2016, we scheduled for two days working with Fort Collins. The first one was at Shields Ponds on Saturday April 30 where we worked on surfacing a new trail. The second Natural Areas work was July 23rd at the Gateway Natural Area. If you would like to assist with events, contact Dave Morse. Work can range from pruning bushes to grading trails to constructing new stone steps, depending on your skills and abilities. Thanks. You get free lunch, free parking and an afternoon to fish in the area after our work project. On as glorious a summer morning as one could wish, a group of 12 eager volunteers gathered at Gateway Natural area to lend their energies to rehabilitating the two major foot trails in that Fort Collins Natural Area. It was 8 AM on Saturday, June 29. The volunteers were greeted by Todd Juhasz and his two assistants, Judd and Scott. The volunteers were: Scott Baily, Donna Burrill, Tim Cochran, Al Fink, Tim Gaines, Beverly Morse, David Morse, Jerry Pelis, Dave Piske, Bruce Rosenthal, Phil Wright, and Stan Woodring. Photo by All Fink Forming into three teams, two of the teams hiked to the Black Powder Trail where they constructed rock steps to make the climb to the summit easier than it had been. And they also generally improved water drainage along the trail. The third team went to the Overlook Trail where they restored the critical edge of the trail by reducing a berm that had accumulated from the high volume of hiker traffic on that trail.The reconditioned tread now drains runoff water as if it were new. Overlook Trail Crew: Photo by Todd Juhasz After just three hours of concentrated efforts the planned work was complete, and it was time for refreshments. After a delicious and substantial lunch provided by Avogadro’s of Fort Collins, and receiving praise from the Natural Areas staff for the well-done job, the volunteers dispersed to other activities of their individual choices. The Fort Collins Natural Areas staff, and the hundreds of hikers using these trails greatly appreciate the trail improvements produced by these volunteers. And the City of Fort Collins has expressed its appreciation for the volunteers' accomplishments by providing a handsome sign recognizing Rocky Mountain Flycasters volunteers. The sign is mounted on the kiosk adjacent to the picnic shelter where we enjoyed lunch-time refreshments. Evidence of the intensity of the crews’ efforts and the resultant joys from their success, is seen in these photos of the teams at the work sites on the trails. Completed step construction On Saturday, September 8, sixteen RMF volunteers and four staff members from Fort Collins Natural Areas combined to create four work teams that produced substantial improvements on a popular hiking trail at Gateway Natural Area. Each team, coached by a Natural Areas professional, applied specific trail restoration skills to the Black Powder Trail that overlooks the confluence of the North Fork and the main stem of the Cache la Poudre River. One team cleared overgrown vegetation that had almost totally obscured what had originally been part of a trail loop at the summit of the trail. Burned pine cone The result provides hikers some new views of the river far below. Another team focused on repairing the trail’s critical berm to improve water drainage and thereby preserve the tread of the trail that is more than 75 years old. Two teams reconstructed rock stairways on steep sections of the trail, creating a more hiker-friendly ascent of the trail. Three hours of trail reconstruction were followed by a tasty lunch in the gorgeous setting of the picnic shelter alongside the Poudre River. Lunch and amenities were cooperatively provided by Catherine Dillon, Service Learning Coordinator at Fort Collins Natural Areas and RMF’s Volunteer Coordinators for the past two years, Teri and Scott Gardner. Teri and Scott, who are relocating their home to south of Denver, were warmly thanked for their roles in making this and the two previous Gateway Parties so successful, and they are also wished a successful transition of their homestead. Fort Collins Natural Areas will soon have signage in place in Gateway Natural Area recognizing the support of RMF’s volunteers who maintain and improve the hiking trails in that Area. The next time you visit Gateway, look for it near the trail heads. Working up the Black Powder Trail Early on the refreshingly cool morning of September 10, twelve RMF TU volunteers gathered at the Fort Collins Gateway Natural Area in the Poudre River Canyon. They were there for the second, and last for this year, Trailgate Party. To open the party, and with six deer appropriately romping in the meadow behind her, Catherine Dillon, Service Learning Educator at Fort Collins Natural Areas Group, presented an illustrated talk on wildlife recently observed in the Gateway Natural Area. Her talk, based on observations recorded by Ranger Steve, was applauded by the volunteers as the deer paraded off-stage toward the Poudre River. Then Todd Juhasz, Trail Technician at Fort Collins Natural Areas Group, explained the tasks the volunteers were to undertake. One part of the work involved drainage improvements on the Overlook Trail. Widening of its corridor had been the object of volunteers’ attention during the first Trailgate Party in August. The major attention this day was on the Black Powder Trail. It involved clearing bushes obstructing the trail corridor and also making trail drainage improvements at strategic locations. The energetic volunteers completed all the work that Todd had set as the objective for the day within the planned three-hour time span. Todd supervised the volunteer team doing the drainage improvements, and Catherine lead the team doing the corridor widening. Those who worked on these two trails in 2011 recognize the need for additional loving care of these great trails next year. To facilitate that, RMF TU expects to continue the Adopt-a-Trail Agreement with the Fort Collins Natural Areas Program in 2012. In the inaugural session of Trailgate Parties on August 6, fourteen RMF TU volunteers had a very productive and enjoyable morning on Saturday, August 6 at the Fort Collins Gateway Natural Area in the Poudre River Canyon. Service Learning Educator To open the session, Catherine Dillon, Service Learning Educator at Fort Collins Natural Areas Group, presented an interesting introduction to the Overlook Trail by describing its history based on historical research she had conducted. Her talk was applauded by all the volunteers. Also, the snacks and other amenities Catherine provided for later consumption were appreciated by all. Then Todd Juhasz, Trail Technician at Fort Collins Natural Areas Group, explained the tasks the volunteers were to undertake. The work involved widening the Overlook Trail corridor by clearing bushes obstructing the corridor and also making trail drainage improvements at strategic locations along the Overlook Trail. The energetic volunteers completed all the work that Todd had set as the objective for the day within the planned three-hour time span. To conclude the organized portion of the day, RMF Volunteer Coordinators Teri and Scott Gardner produced a delectable luncheon they had procured from a local sandwich shop. After a breezy, sunny, but not-too-hot morning of trail improvements, the lunch was quickly consumed by all those present. the Gateway Park area of the Poudre River To close the Trailgate Party, all those who had the time and inclination went flyfishing in the sparkling waters of the Poudre River, only recently transformed from its more challenging high flows during this year's extended snow-melt flows. The entire event was well-planned by Catherine, Todd, Teri and Scott and all the volunteers appreciated those preparations that made the day go so smoothly. The next Trailgate Party at Gateway is scheduled at 8 AM on Saturday, September 10. We will work on the longer Black Powder Trail on the other side of the Poudre River. So we hope the recent volunteers will return and, with Black Powder being a longer trail, more volunteers will be needed. So spread the word and sign up by sending an email to Teri and Scott Gardner, RMF's volunteer coordinators, or phone them at 805.551.3698. Tell them you want to volunteer for September 10. Interested in attending a TrailGate Party? It's a six hour fun event that combines giving first-aid to the environment along the Poudre, followed by a smackingly good picnic lunch, and then topping it off with some fly fishing, all in one day! How does that sound to you? Now that you know what a TrailGate Party is, can you believe that we will actually be having two of them this Summer! Now, would you like to attend? We are accepting Volunteers, we mean Attendees, right now. Sign-up now so you won't be left off the Attendee List. Let us know if you want to help out on August 6, or September 10, or attend both days at Gateway Natural Area in the Poudre Canyon. Here is what we will do. At 8 AM each day we will renovate foot-trails that are sadly in need of our help. At eleven we will enjoy a picnic under the canopy of one of the new shelters in Gateway Natural Area. And after the picnic you may fish on the North Fork between its confluence with the Poudre and the Seaman Reservoir, or wherever you wish on public water in the main stem of the Poudre. 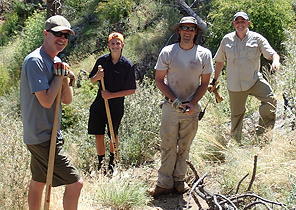 RMF TU has entered into an Adopt-A-Trail Volunteer Agreement with the Fort Collins Natural Areas Program. It pertains to the Gateway Natural Area. The heart of the Agreement provides for TU volunteers to assist in maintenance of the Overlook and the Black Powder trails under the professional supervision of Natural Areas employees. Both trails boast gorgeous views of the North Fork and the main stem of the Poudre River. Long-time Poudre anglers may remember Gateway as the site of an enticing, but forbidden, horseshoe bend in the main stem of the Poudre. For many years it was closed to public access and fishing. It's now open to the public. The public facilities at Gateway have been modernized and improved, with the exception of the two hiking trails. The trail corridors are densely overgrown with mountain mahogany and the trails' surfaces can benefit from erosion control techniques. By joining the TrailGate parties you can learn some tricks of the trade of trail maintenance and renovation. The physical activity will be similar to the trail maintenance work that RMF volunteers have conducted during the past 6 years at Larimer County's Eagles Nest Open Space. So, Gateway will be an addition to what RMF volunteers are already doing to protect and maintain trails in our nearby public lands and natural areas. Teri and Scott Gardner, new members to RMF, will serve as co-coordinators for volunteer signups. Those interested in volunteering for one or both of these dates should reach out to them via email or via the phone at 805-551-3698 (yes, they still have their California phone number). For each day, we are looking for up to twenty (20) adult volunteers given the type of terrain and trail lengths we will encounter. Please be aware that the daily parking fee for entry to Gateway has been waived for RMF TU volunteers on August 6 and September 10 only.